DETROIT — It took the Detroit Pistons over three minutes to score in their first game under new coach Dwane Casey. Then at the end, they committed two straight shot-clock violations while trying to close out the victory. Andre Drummond had 24 points and 20 rebounds, and Detroit won 103-100 over the Brooklyn Nets on Wednesday night. 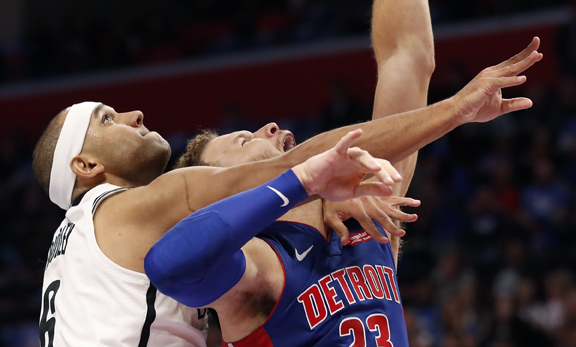 Blake Griffin added 26 points for the Pistons, who were without two potential starters but still managed to hold off Brooklyn. Caris LeVert equaled a career high with 27 points for the Nets, and he drove to the basket in the final seconds with Brooklyn down one. LeVert lost the ball, and it went out of bounds to Detroit. Reggie Jackson made two free throws for the Pistons with 6.2 seconds remaining, and Joe Harris missed a 3-pointer from near the top of the key at the other end. The Pistons hired Casey this offseason after moving on from Stan Van Gundy, and his debut began inauspiciously. The Nets scored the game’s first eight points, and Brooklyn’s Jarrett Allen made an impressive defensive play early when he blocked a Griffin dunk attempt.